Undercover Texas Ranger Garrison Travis vows to protect witness Kenderly Tyler from mafia assassins while clearing himself of murder charges.On the run, they find more than adrenaline pulsing between them, but can they actually make it out alive? Presumed dead, Wade Calloway has returned to the only person who can help him take down a dangerous cartel, Sheriff Samantha Calloway — his wife.If they can finish his assignment, they just might find a fresh start. 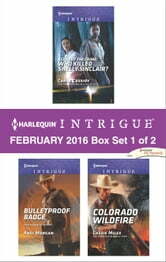 Look for Harlequin Intrigue's February 2016 Box set 2 of 2, filled with even more edge-of-your seat romantic suspense!